DIY Maintenance - Sundance Rental Management Inc.
Use 1/2 cup chlorine bleach or Wagner Pro-Treat monthly in the condensate drain line to prevent algae from clogging the condensate drain line in the A/C system. 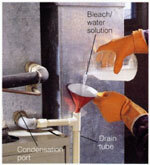 This can be done via a plastic pipe (about 1" diameter) in front of the furnace. If the pipe has a stopper with wires coming out of the top lift off to access the opening. Do not pull off by the wires. Locate the air filter. Depending on the HVAC design, it can either be located in the blower door unit itself or located between the blower and the return air duct. You may need a screwdriver to help pry open the access panel or blower door. Make sure unit is OFF before removing the filter. Once removed locate the size for proper replacement (ex. 16x25x1.) 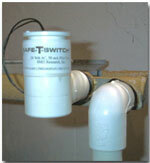 Replace the filter as directed, using the air flow directional on the filter. This MUST be done monthly. To prevent your lawn pump from cracking in the winter due to freezing temperatures you will need to drain the water from the pump. First make sure that your timer is in the OFF position. Then locate the lawn pump and you will find either a wing nut or a drain screw (illustration below) on the front of the pump. Open the hose bib on the top of the pump (if equipped) and remove the drain screw or wing nut. Water should drain out immediately once the wing nut or screw is removed. Once all the water has drained out put the screw or wing nut back in its original position and close the hose bib. NEVER run the pump once it has been drained. It is also highly recommended to insulate any exposed pipes during freezing temperatures. If you have a jet pump or city water irrigation system you will need to insulate all exposed pumps, pipes, and back flows from the elements to prevent freezing. To use the pump again you MUST fill the pump with water by attaching a hose to the hose bib on the pump and filling. Once the pump filled close the hose bib, turn off the water, and detach the hose from the pump. You will then turn the pump to the ON position to ensure that the pump has been re-primed. 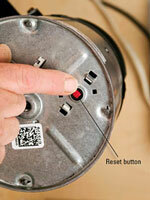 Most disposals have a "RESET" button on the bottom or side of the unit, this acts as a "built in" circuit breaker. Depress this button to reset the unit. If that does not work try the actual circuit break in the electrical panel. An "Allen" wrench will fit into the bottom of the disposal. With the unit turned off or unplugged, insert the tool into the bottom of the disposal. Move it clockwise and counter clockwise to loosen the jammed unit. Once you believe the unit to be clear of the jam, plug the unit back in and turn it on to see if it rotates. If this does not work it is a good possibility that the motor is locked up and the disposal will have to be replaced. Do: Insert food slowly, Use cold water for at least 20 seconds, Keep it clean. Do Not: Use hot water, grind fibrous or expandable foods, turn off the motor too quickly, wash coffee ground down the drain, wash any oil/grease down the drain, or forget to use it. First try resetting your circuit breaker (instructions below.) If resetting a tripped breaker is not effective, it could be a tripped GFI. 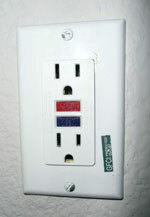 The GFI is a "mini" breaker located inside an outlet within 10 feet of a water source (ie: a sink). This GFI "button" tends to be red with a rest/reset noted on it, located directly on the outlet cover. This prevents electrocution by shutting off power immediately if electrical current comes in contact with water. A GFI is most likely located in the bathroom, kitchen, garage, or at the circuit breaker panel box. Look in these areas for the GFI and be sure the reset button is depressed. The toilet flapper is often the cause of a toilet continuously running and is simple easy fix. Follow the links to a short and easy step by step video for replacing the toilet flapper. If this easy repair does not stop the toilet from running please call our office to place a work order. A circuit breaker which has been tripped will either be in the middle or "OFF" position. Locate the tripped circuit breaker and reset it by pushing it all the way to the "OFF" position and then back to the "ON" position. Often when you can't cannot reset the circuit breaker, it is because it must be turned all the way to the "Off" position first. Electricity should now be restored to the circuit. If the circuit breaker trips again before you have turned anything on or plugged anything in, the breaker itself may need to be replaced (call our office.) If the circuit breaker trips after plugging in or turning on a device, that device may have a short or may be placing too much of a load on the circuit. If no circuit breakers were tripped and you still do not have power at an outlet, there may be a wiring fault, the outlet may be defective or it may be on a GFCI controlled branch circuit. Refer to the section above for resetting an outlest with no power. 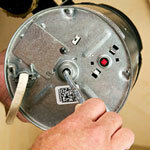 If the garage door opener will not open or close properly be sure that all obstructions in the hinge and spring area. Many openers have and "electric eye" or sensor that me become obstructed. If so, remove the obstruction. At times these sensors may become misaligned. If the light on the sensor is blinking, it means the two sensors are not aligned and need to be adjusted to become aligned. Once alignment is made, the lights will discontinue to "blink" and the obstructions will be eliminated.